From Gomer Pyle, U.S.M.C. to M*A*S*H, the military has proven to be a successful setting for television series. Even characters like George Jefferson and Steve McGarrett were given backstories in the Navy. And no wonder, as veterans of World War II and the Korean War returned from service and settled into suburban life, TV networks looked to celebrate their service and tell their stories. Here, we are going to focus on the U.S. Navy. A fleet of TV shows have been set on the high seas, from drama to comedy. Let's take a look through the periscope. When JAG (the acronym stands for Judge Advocate General) hit the airwaves in 1995, it hardly looked like a smash. Ratings almost sunk this battleship in its first season. The action-drama ranked a measly 79th overall. JAG's future looked uncertain. However, with a second tour on a different network, the series grew to become one of the quietest pop-culture success stories of the new millennium. Thanks to its alluring stars David James Elliott and Catherine Bell, not to mention a heavy dose of military realism, JAG sailed for ten seasons and spawned even bigger spin-offs. You can't talk about JAG without mentioning the armada of spin-offs that came in its wake. 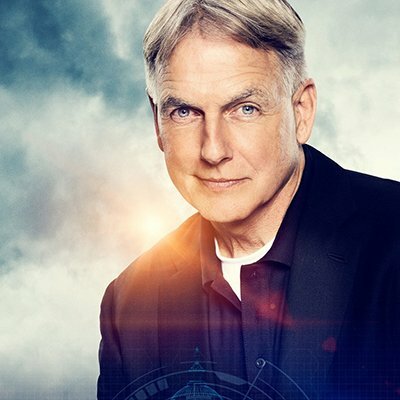 NCIS continues to gun for Gunsmoke's record in its 16th season, while the subsequent NCIS: Los Angeles and NCIS: New Orleans continue to rank among the most-watched dramas on network television. Rolling back the clock several decades, we find one of the earliest military shows on network television, a documentary series on NBC that chronicled the hard-fought victories of World War II mere years after the end of the global conflict. Compiled from millions of feet of Navy footage, Victory at Sea featuring the invigorating music of Richard Rogers, of Rogers and Hammerstein fame. Airing on both ABC and CBS, this dramatic anthology series remains most notable for its impressive list of budding guest stars, from DeForest Kelley (a former member of the United States Army Air Forces) to Clint Eastwood (former Army man) in one of his earliest TV roles. 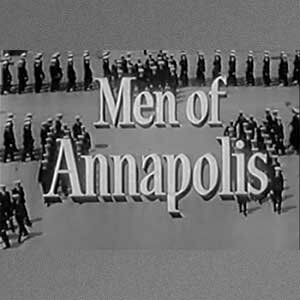 The only show to have been filmed at the U.S. Navy Academy in Maryland, The Men of Annapolis marched for 41 episodes in syndication. 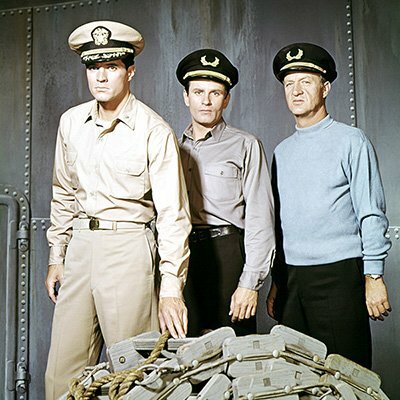 The anthology series focused on fictitious Midshipmen, and featured guests stars such as Robert Blake and Fred Astaire. Another dramatic anthology series, The Silent Service focused on stories set under the water. 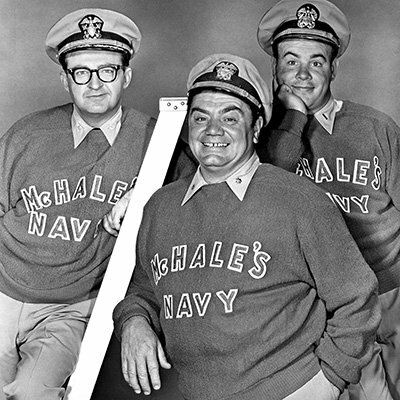 Each episode told the history of a submarine in service, from the USS Bergall to the USS Wahoo. Many future TV stars of the 1960s honed their craft here, including Russell Johnson (Gilligan's Island), DeForest Kelley and Leonard Nimoy. The second track on Bob Newhart's Grammy-winning comedy album The Button-Down Mind of Bob Newhart, "The Cruise of the U.S.S. Codfish," was a spoof of this syndicated show. Former Little Rascal and Our Gang member Jackie Cooper set the mold for how to navigate a career after being a child star. 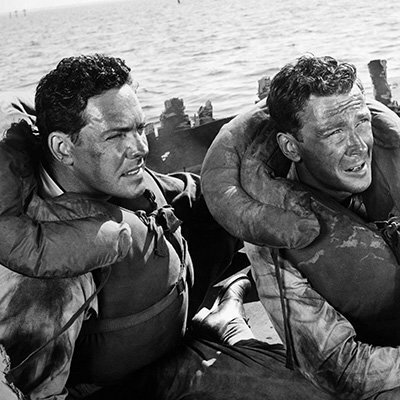 The actor served in the Navy during World War II and returned to the screen for this overlooked comedy-drama set in a Naval hospital in San Diego. In a way, it blazed a trail for gems like M*A*S*H.
"Four men… welded together in a united team to conquer the unexplored reaches of the heaven," the opening proclaimed. This Sixties aerial adventure centered around the world-famous flying squadron, featuring aviators from the Navy and Marine Corps. 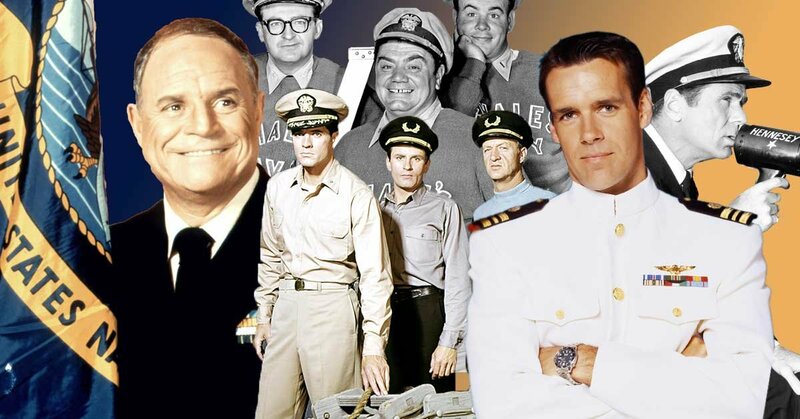 Like Men of Annapolis, the series ran in syndication, and featured rising stars like Burt Reynolds and Ernest Borgnine. Disney darling Dean Jones entertained a generation of Boomers in movies like That Darned Cat! and The Love Bug. 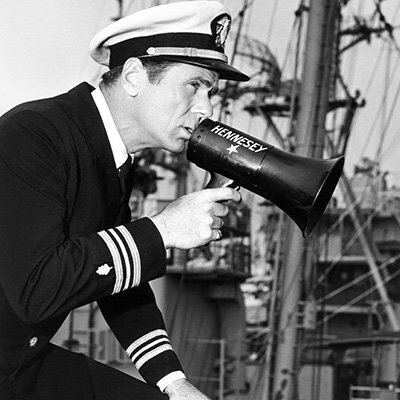 Before going to work for the House of the Mouse, 31-year-old Jones played this titular Navy Ensign, who served in the Pacific aboard the USS Appleby. Jones was no stranger to the material, which was based on the semi-autobiographical books of William Lederer. 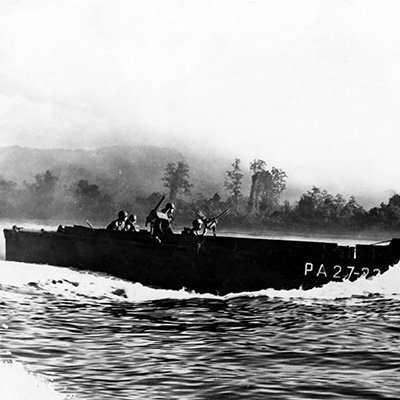 Jones himself was a Navy veteran, who had served during the Korean War. Future M*A*S*H star Harry Morgan popped up as a guest star, while a young Beau Bridges had a recurring role. Ernest Borgnine, who served in the Navy aboard an antisubmarine ship in World War II, was obviously well-suited for playing military men. 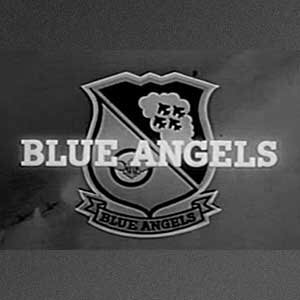 Like The Blue Angels, the focus was, as the title implies, clearly on the Navy, though Marines played a significant part in the stories, especially the pilot episode. The series served as a launch for the brilliant Tim Conway (a former Army man), who went on to comedy glory on The Carol Burnett Show. Despite the groan-worthy pun of the title, this pioneering women-driven comedy deserves more notice. 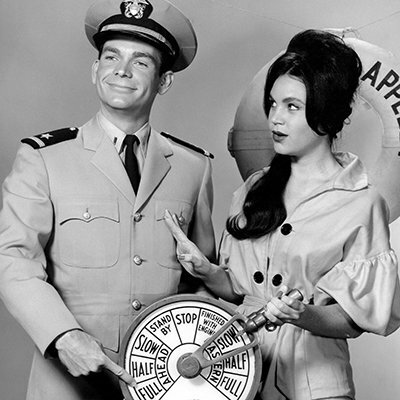 A spin-off of McHale's Navy, where Kathleen Nolan's lead character Lt. Anne Morgan had made her debut, Broadside told tales of the WAVES, a.k.a. the Women Accepted for Volunteer Emergency Service, during WWII. Sheila James (now Kuehl), formerly Zelda Gilroy of The Many Lives of Dobie Gillis, would co-star in her final regular TV role. (Today, she is a politician in California.) Joan Staley (Okie Annie on Batman) and Lois Roberts rounded out the cast of one of the first female workplace comedies. Not to be confused with the 1975 novelty song that helped ignite the trucking craze of the Seventies (and inspire an eponymous motion picture), this Convoy was an NBC drama for one brief season. 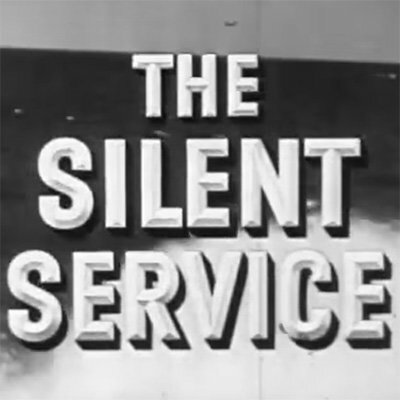 Because it recycled reels of stock footage from World War II, the show would be one of the last fully black-and-white production for the network. 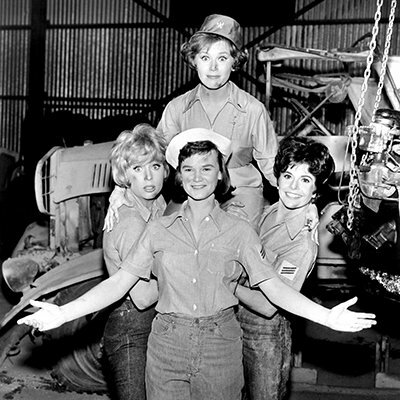 The lack of color (which we can see in this promotional photo) led to its ratings demise. 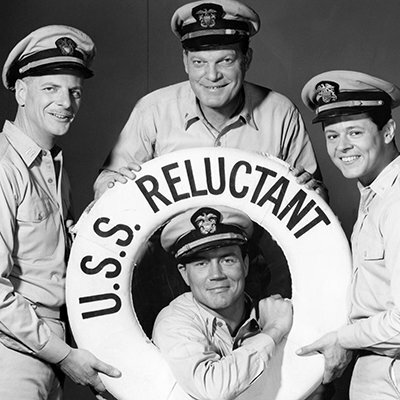 An adaptation of a prior hit novel / play / film, Mister Roberts centered around a WWII cargo ship called the USS Reluctant. Former NYPD cop Richard X. Slattery played the barking captain of the ship. He made a career of similar roles, on war shows both serious (The Gallant Men) and comedic (C.P.O. Sharkey). 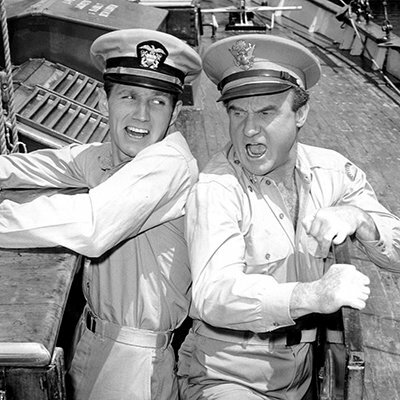 Despite its title, this comedy about a two-mast schooner in service during WWII featured Gary Collins (pictured left) as a Navy man. NBC's adaptation of the hit Jack Lemmon and Ricky Nelson movie instead starred future TV host Collins and Emmy winner Jack Warden (Brian's Song). As a young man, Warden had served in China for the Navy, sailed as a Merchant Marine, and jumped from planes as an Army paratrooper. The day before D-Day, he shattered his leg in a jump. During his recuperation time, he decided to become an actor. Collins, too, had served in the Army. Harry Morgan also turned up in this series. No wonder Col. Potter seemed so experienced. 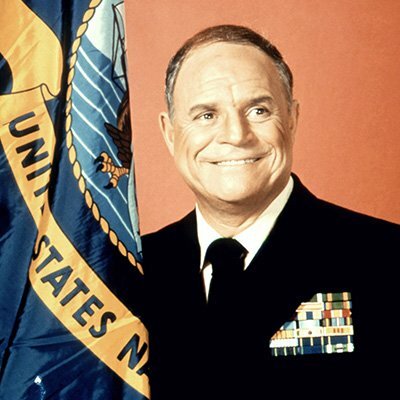 Rickles served as a seaman first class on the USS Cyrene in World War II. No wonder the funnyman looked so comfortable in his film debut, the serious drama Run Silent, Run Deep. He put his experience to comedic use in this NBC sitcom. C.P.O. Sharkey cast him as a U.S. Navy Chief Petty Officer in charge of an eclectic mix of characters ripe for his trademark insults. The show also can claim to feature one of the first depictions of punk rock and moshing on American televisions, as the Dickies turn up in the 1978 episode "Punk Rock Sharkey." Can you identify these celebrities on JAG?